For most of human history, we effortlessly consumed (nose-to-tail) the things we needed for strength, health and happiness. Like the fertile ground that we once walked upon, we were a natural extension of this earth. In the modern world, we unknowingly struggle to fulfill our nutritional needs in order to support and sustain a vibrant, disease-free life. We are now part of a world where neurodegenerative conditions, mood disorders and impaired brain functioning run amuck. Whole food, nutrient dense organs and glands can provide great benefit for those seeking targeted support in harmony with nature — the old fashioned way, the way that our early ancestors did. 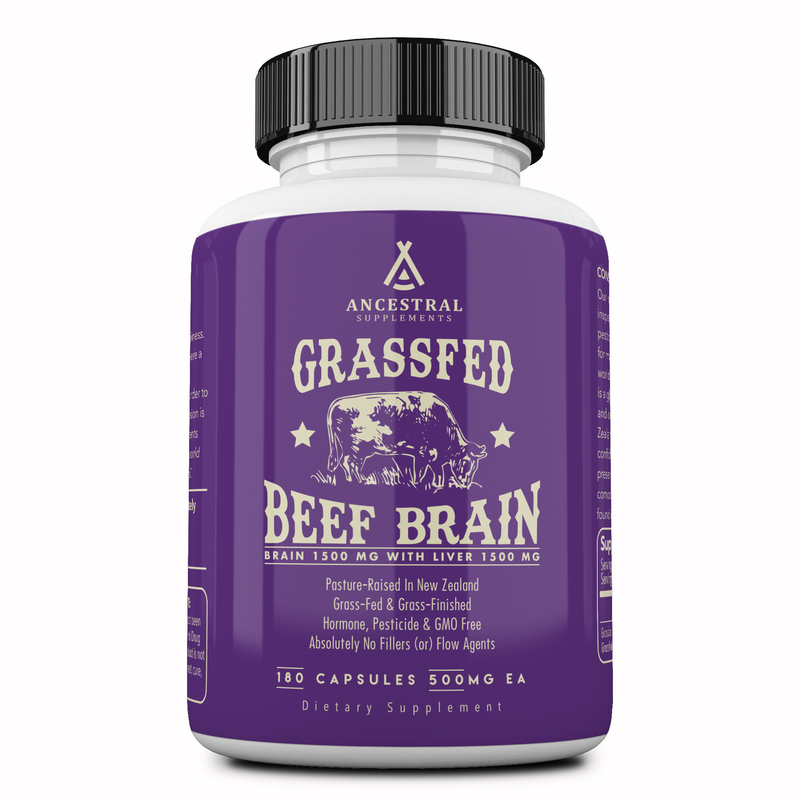 Grass Fed Beef Brain is a whole brain extract and dietary supplement that provides 100% pure bovine brain with pituitary, hypothalamus and pineal gland in the same balance that exists in nature. Our mission is our purpose... putting back in, what the modern world has left out. Organs and glandulars were a staple of our early ancestors' diets as the ultimate superfood, for good reason. It turns out, this nourishing tradition is backed by science... "Radioisotope labeling studies in animals have shown conclusively that, when eaten, organs and glands selectively travel to the corresponding organs and glands in high concentrations. This research, done at the University of Scotland in Edinburgh, lends credence to the ancient practice of eating animal organs to help ensure health in one’s corresponding organs..." - Dr. Ron Schmid, ND. * Our early ancestors knew this, which is why their traditional diets included the frequent and nourishing consumption of nose-to-tail organs and glands. Six capsules provides the equivalent of one ounce of fresh, raw whole glandulars and organs that you’d get from your local farmer (or) butcher. Our Grass Fed Brain (with liver) is a whole food dietary supplement that provides whole brain extract — including pituitary, hypothalamus, pineal glands in the physiological amounts that exist in harmony with nature. This supplement can be taken with (or) without food (even though it technically is food). The suggested use is 6 capsules a day or as directed by a healthcare professional — for added support, the dose can be doubled. This supplement can be consumed all at once, or divided servings throughout the day. Not all organs and glands are the same. Look for the highest quality brain glandular... It should come from pasture-raised, grass-fed calves that are hormone, pesticide and GMO free. If considering a supplement, look for one that is ultra pure (without binders, fillers (or) flow agents) and look for the freeze dried variety as these have been shown to optimally preserve nutritional factors, growth factors and co-factors. NOTE: Desiccated brain (or) whole brain extract glandular can be found on the market by various names: whole brain, brain extract, desiccated brian, brain glandular, brain PMG belongs to Standard Process and then there's simply bovine brain. As it relates to potential microbes and parasites, our product is 100% freeze dried in contrast to the heat processed varieties out there. This process preserves heat sensitive biological activity while removing 98 - 99% of the moisture content. This leaves virtually no moisture; since microbes (viruses, bacteria, parasites etc) can not survive without moisture, this allows for an ultra pure product profile with a very long shelf life — of course, with no need for additives or preservatives. There has never been a single case of mad cow disease in New Zealand. BSE (mad cow disease); scrapie and other known TSE’s, do not occur in New Zealand. A national surveillance program is in place to provide comprehensive monitoring. I put the care, attention and quality assurance into my products as if I am giving them to my family... because I am! My young boys, my wife and I all take the Beef Liver, Beef Organs and Bone Marrow everyday. For these reasons, my tribe (my family) and I follow seasonal eating patterns that allow us to slip in and out of ketosis. If we're feeling really good, we may stay in it a little longer. It helps us to think, to perform, and to produce. The following is an idea of how and what we eat... notice that we also go through periods of feast and famine with twenty-four hour fasts and huge refeeds where almost nothing that resembles primal food is off limits. This shake takes me about 15 to 20 minutes to make... It's super convenient... and, it's down right delicious. If I don't make a shake, I will have a bunch of pasture-raised eggs (8 or so) that are smothered in butter with a side of avocado, nitrate-free, sugar-free bacon and a dollop of sour cream. We generally carb reload on the weekends with plenty of sweet potatoes, raw local honey, the occasional sorghum and various in-season fruits. We also do a twenty-four to thirty hour fast on Sundays... it's not as bad as it sounds. We eat an early dinner as we normally would on early Saturday evening... skip our first meal on Sunday, and eat an amazing fish-based dinner (usually wild caught sardines) with the entire tribe on Sunday. We also do heat and cold exposures together and we go on barefoot hikes every Sunday. Connecting to mother earth creates strong parasympathetic tone for enhanced recovery for the week to come. The basis of how our tribe lives is this... if our early ancestors did it, we do too... or at least we try to. See our most up-to-date tribe life on our "About Us" page. Transdermal Magnesium Oil - We use magnesium oil every night. Keep in mind that my tribe and I eat a very nutrient dense diet. We consume the whole animal just as our ancestors did... That's right, we eat the liver, kidney, pancreas, spleen, heart, thymus, bones, tendons, ligaments and more... and we eat this way every day (except on vacation we take Liver, Beef Organs and Bone Marrow supplements). We love our bone broth (this is my wife's specialty), and we eat tons of pastured eggs. Wife is awesome enough to sprout chickpeas for us. Then, she turns half of the batch into the best homemade hummus in the world. Super high in folate (NOT SYNTHETIC FOLIC ACID, big diff)!! You never know, ketosis could easily be the missing link to the mood, memory and mental performance benefits that we are all after. Why not give it a try. Send me an email... let me know your thoughts... let me know your questions. I'd love to hear from you. Our mission is our purpose... putting back in, what the modern world has left out. “Bovine pituitary gland extract.” Bovine pituitary gland extract, www.doctorslounge.com/endocrinology/forums/backup/topic-12915.html. Accessed 27 Aug. 2017. “Sphingomyelin.” Wikipedia, Wikimedia Foundation, 11 Aug. 2017, en.wikipedia.org/wiki/Sphingomyelin. Accessed 27 Aug. 2017. “Brain-Derived neurotrophic factor.” Wikipedia, Wikimedia Foundation, 24 Aug. 2017, en.wikipedia.org/wiki/Brain-derived_neurotrophic_factor. Accessed 27 Aug. 2017.